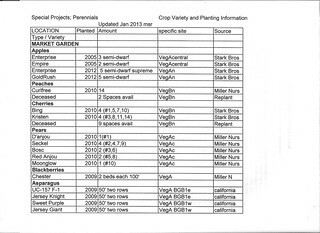 Report on status of Perennials and practices from 2013. Also note: CH Served as ‘Farm Manager’ from July to end of Season, to cover for MR.
Site Details; infrastructure and fields managed by North Slope Farm, planted areas and future expansion delineated by Field Maps. Enterprise; Establish recommended varieties of diverse Perennial Crops to get practical experience with the crop management and make judgments about the crop viability on our Farm. Make use of ‘marginal agricultural land’ for minimally disruptive, long term crop production. When North Slope Farm was purchased in 1994, there was a single, old fruit tree growing next to the farmhouse. A crunchy, tart pear, great for storage, we refer to it, fondly, as the” farmhouse pear”. The following year, six apple trees and two Asian pear trees were planted around the farmhouse. All of these trees have grown to produce beautiful blossoms, organic looking but delicious fruits, while also providing a perfect classroom for practical’s, in pruning and observation, of the short and long term needs of these valuable members of our community. By 2005, the main vegetable production areas were well established and incorporate perennial herbs and flowers, as well as “wild strips”; a place for our native plants, insects, birds and critters. As stewards of this land, always looking to diversify flora and fauna, the next step in this journey was to establish more fruit trees. Five apple trees were planted in the market garden and plans for a larger expansion were solidifying. Expansion of perennial plantings is often a risk, due to potential for loss. In 1997-98 we lost a new block of 40 Apple saplings, due to lack of irrigation and Rabbits chewing the bark from the trunks. In 2010, with fifteen years of experience in vegetable and flower production, the land and its stewards were ready to get rolling on plans which would establish more diversity of berries and fruit trees within the “Market Garden” and “Corner Garden”. The plans also included the establishment of a 1/6th acre plot dedicated to fruiting perennials and a 50’x 25’ area for hazelnuts. These planting areas, known respectively as the “Fruit Cluster” and the “Sycamore Plot”, were chosen based on their proximity to infrastructure but also because these soils are least suitable for annual vegetable production. This ambitious 2010 plan included: (Peaches) 20 Curlfree, (Pears) 3 Bosc, 3 Red Anjou, 4 Seckel, 2 Moonglow, 2 D’Anjou, (Cherry) 6 Kristen, 10 Windsor, 6 Bing, (Asian Pears) 2 Large Korean, 2 Chojuro, 2 Shinseki, 2 Hosui, (Apples) 3 Enterprise, 3 Goldrush, 3 Jonafree, (Paw Paw) 4 American, (Fig) 5 Brown Turkey, (Gooseberry) 4 Pixwell, (Hardy Kiwi) 6 male, 3 female, (Grapes) 3 Ontario, 3 Buffalo, 3 Candice, (Blackberries) 72 Chester, (Strawberries) 400ft mixed Albion, Earlyglow, Sparkle and Honeyoe, (Filberts) 3 Butler, 3 Barcelona, 3 Royal, 12 Fingerlakes. Future discussion: Assess production management; strengths and weakness. Assess production potential and identify limitations to operation. Identify values and costs of enterprise not reflected in hard data collected.